It was a dark and stormy night. 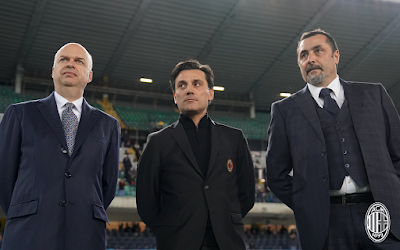 After having changed ownership and then spent over €200m to buy a whole new starting eleven this summer, Milan were precariously perched at eighth place on the table. In their first 11 league games, they had lost a shocking five of them, making fans cower in fear. And every time they lost a match or played poorly, there were unholy voices whispering, nay screaming incantations of fear and dread regarding the club’s financial status and future. It was enough to make fans’ blood curdle. 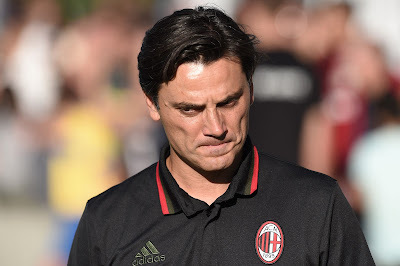 At the center of this nightmare was the coach, Vincenzo Montella. Initially, he seemed harmless enough. He had coached our talent impoverished team to a sixth place finish last year. Nothing sinister there. Although that sixth place finish came with Europa League commitments this year. And like a ghost with chains, perhaps it was all part of his evil plans after all. But it was this season that the black magic began. Last year, he was obsessed with possession, but this year, he was simply possessed. He insisted on playing the 3-5-2 formation, despite not having the players or the depth. So frightening. Having started with a four man back line, it was like those horror movies where they make you feel comfortable and safe, and then suddenly all hell breaks loose. Just like in those movies where the sweet, naïve girl opens the door when you know she shouldn’t, the defense was first to die. Even our best defender couldn’t fight the dark powers that fought against him. We lost our speedy and reliable right wingback to a horrifying injury. And no matter how terrifying the results or performances, Montella just kept forcing the evil system, like a zombie that won’t die. And as if that wasn’t scary enough, he started rambling incoherencies in press conferences. Like he didn’t know what happened against Lazio. The three man back line would give us security. He didn’t know which trousers went with which socks. It was enough to make you call an exorcist. How does this end? Is it even possible to come out of this smiling? Will Milan continue to trust the bedeviled coach? And if so, how far will we fall? If we fail to make the Champions League, which top player(s) will we have to sell? Will Fassone be able to refinance the Elliott fund debt in time? After five straight years of horror stories at this club, how many sequels will there be until fans can feel safe again? With so much on the line, this horror story is that much more riveting, that much more intense, that much more frightening. But you’ll have to stay in your seats to find out how it ends. Popcorn anyone? Happy Halloween! And if we survive….